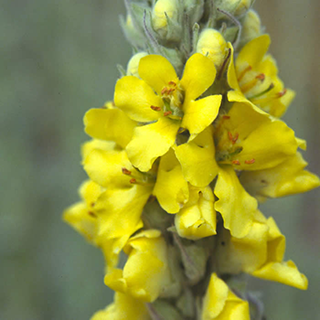 Found from Europe to western China, mullein was traditionally used to ward off evil spirits and cure wasting diseases, such as tuberculosis, which it was once believed such spirits caused. Simply carrying the plant or using it in an amulet was thought to be sufficient. Today it is mainly used in cough remedies and for respiratory disorders. Mullein is a soothing demulcent to the upper respiratory tract - gently astringent and expectorant. It is good for treating upper respiratory infections, cough, croup, sore throat and bronchial catarrh. The combined demulcent and astringent effects make it a serviceable tea for treating mild diarrhoea or infant diarrhoea. There is a secondary nervine effect. The internal use of mullein will almost always prove to be mildly sedative. Make a syrup by combining 1 pint (600ml) of below infusion of fresh flowers with 1lb (450g) of honey or golden syrup: combine the ingredients, bring to a boil, and simmer gently for 10–15 minutes. Take 1 tsp (5ml) doses as required. Macerate the fresh flowers in sunflower oil for 2 weeks, shaking daily. Strain and use to relieve the pain of ear infections (add 2 drops to a cotton ball and place in the outer ear) or as a salve on wounds, skin ulcers, hemorrhoids, eczema, frostbite, blepharitis, or as a chest rub for respiratory complaints. Drink 1 cup (1–2 tsp dry leaves or flowers per cup of boiling water) 3 times daily for chronic coughs, feverish chills with hard coughs, throat inflammations, and to tone the respiratory system. Take 1–2 tsp (5–10ml) 3 times daily of a tincture of the leaf or aerial parts for chronic respiratory disorders. Pick the large fresh leaves of a mullein plant and steam actively until they are flexible, hot and laden with water. Remove from the pot, cool slightly to tolerance and lay directly on the affected area in several layers. Cover with a layer of plastic, insulate with towels or blankets and leave to work for at least half an hour, or even overnight. This is good for shrinking ulcers, tumors and glandular swellings and is a specific treatment for mastitis. Prefers well-drained to dry soil in full sun, and will spread to 3ft (90cm). Sow seeds in a cold frame in autumn or spring and transplant to 3in (7.5cm) pots when the seedlings are large enough to handle. Plant in their final positions when well-established. Self-seeds enthusiastically if growing conditions are ideal. Collect individual yellow blossoms when in full bloom. Cut the aerial parts while flowering and gather the leaves separately.